Ordering a filter is easy. Here is everything you need to know. Filters come in different shapes and sizes. We have all the standard sizes, plus we can make custom filters for you. Where do I find my filter size? Where to find your filter size? On the side of your filter. Dimensions range from 10"x10" to 30"x36." Most, but not all, filters are 1" thick. Some homes will have 2"-5" thick filters. Air filters can be found inside the return vents in your home. These returns might be on the ceiling, wall, or in the system itself. On the side of your filter. Dimensions range from 10”x10” to 30”x36.” Most, but not all, filters are 1” thick. Some homes will have 2”-5” thick filters. Most of our customers swap out their filters every two months. But thanks to our diverse delivery options, we’re sure to have a schedule that suits your needs. We recommend changing filters at least every 2 months if you have allergies, pets in the home, etc. For everyone else we recommend swapping filters out every 3 months. For help deciding the delivery schedule that ﬁts your individual needs, just call or email! Our homes and offices are different and so are our air filters. Your choice of filter grade all comes down to your environment. Find the right grade for you. Like all of our filters, the Standard 800 is American-made. 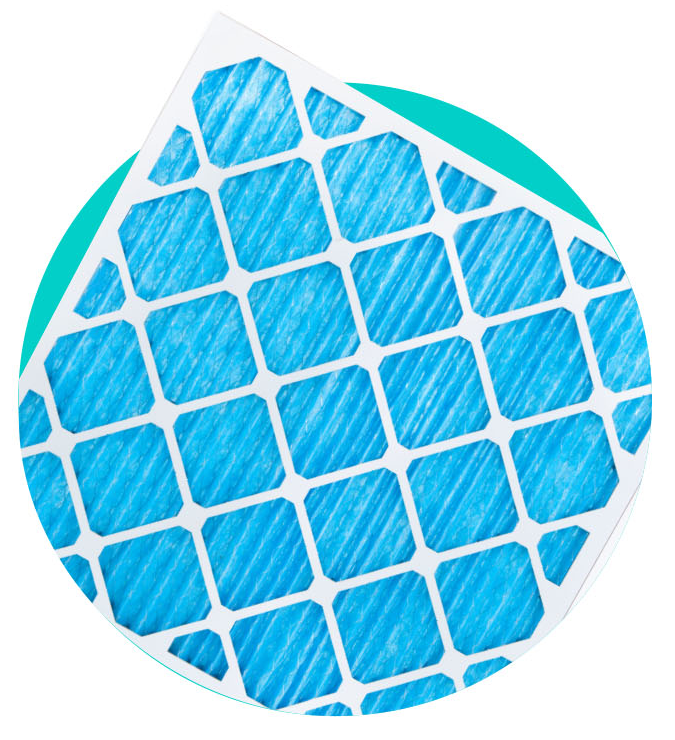 With its Merv 8 rating, it provides basic filtration for the air in your home to keep your lungs healthy and happy. The Standard 800 captures particles and allergens from 3 to 10 microns in size. If you want to rid your home’s air of dust and pollen, this is good filter. This pleated filter is made to protect your family from airborne particles and allergens such as bacteria, viruses, mold spores, pollen, fine dust, and pet dander. The Superior 1100 is an amazing filter. It has a Merv 11 rating and is able to capture particles as little as 1 to 10 microns in size. This American-made Merv 13 pleated filter is the best of the best. The Elite 1300 captures airborne particles and allergens less than 1 micron in size. With this filter, you can say adiós to bacteria, viruses, mold spores, smoke, pollen, fine dust, and pet dander too. This filter will improve your air quality and help your family breathe better. When you want the best – you want the Elite 1300.